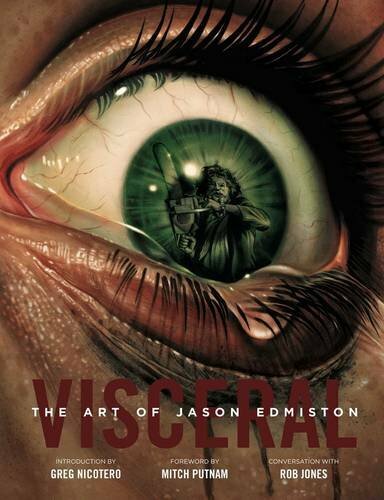 VISCERAL is a fantastic tribute to the years worth of paintings that Jason Edmiston has created. This 288-page hardcover is a bit pricey but definitely worth the money as it's packed with wonderful art from cover to cover. This guy still uses traditional medium, acrylic, for painting and texture of the medium does show with every stroke. I like his take on pop culture subjects. He has drawn horror, comic covers and iconic characters such as Deadpool, ET, Skeletor, Daenerys Targaryen, Transformers, and even Adventure Time and more. He has also drawn for movies and created digital screen prints for Mondo. I also like the use of humour in some of his paintings. Godzilla making out with King Kong, anyone? There ain't much text in the book except for short captions for selected artworks. There are some step-by-step walkthrough on his creative process from start to finish. Lastly, there are a few pages of interview. It is astonishing to see the amount of work featured. Stunning book. This book was borrowed from Basheer Graphic Books for review purposes. You can order the book from them. Check with Basheer on Facebook.